On Thursday at 9:30 am police in Geneva say that they took one man into custody after an investigation into a domestic incident. Authorities say that the domestic incident took place and involved a gun, which prompted the call to police. 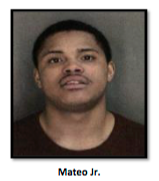 The suspect, who was later identified as Nelson F. Mateo Jr., was arrested at his home on Pulteney St., around 10:30 am and was charged with a number of charges. He was charged with unlawful imprisonment in the first degree, with additional felony charges pending. A search warrant of his residence was also executed. Bail was set at $100,000 cash, or $200,000 secured bond.